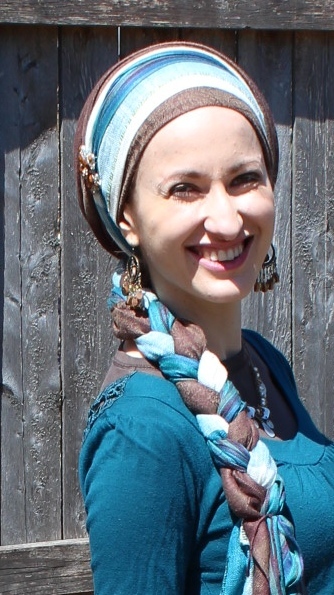 Decided to wrap The Naomi Knot today and instead of putting my necklace around my neck (who does that!? lol) I thought it might do better on my head! I’m loving it, and haven’t even added earrings or makeup! What do you think? My outfit today is a bit of an enigma; I don’t remember how it actually materialized. 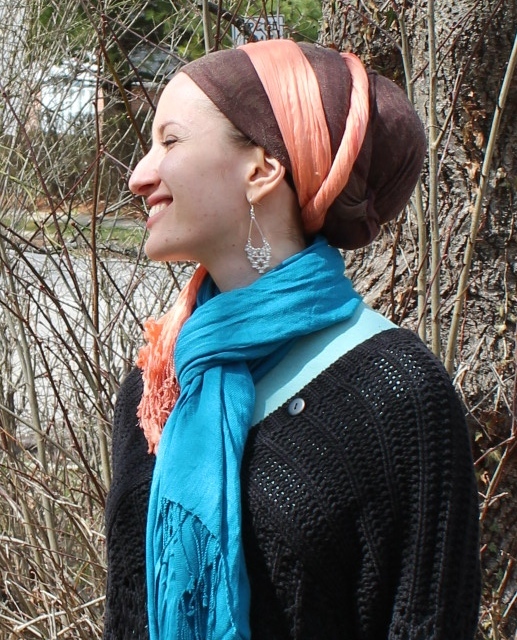 I started off with my brown stretch pashmina tichel, a wrap skirt and a mint shirt, but between taking photos, getting cold (hence the sweater and scarf around my neck), and adding an extra sash scarf on my head, I ended up feeling VERY mismatched. And do you know what’s even more mysterious? I have barely left my house today (yet), and have already received glowing compliments from the many people that have come over! I was like, “really”?! But the women commenting are very stylish, so I decided to believe them! So I’m going to go out like this! I guess it does all look pretty funky! And here is the awesome mismatched yet somehow working outfit! My skirt is from Israel when I went there for the first time! I remember being so hesitant to buy it because it ‘wasn’t my style’… and now it’s one of the most worn skirts in my wardrobe! Today is such a gift! We hosted a vibrant, bustling in-person Wrapunzel event this morning at Rivka Malka’s house – it was so much fun bonding with all these beautiful women and teaching them how to wrap! 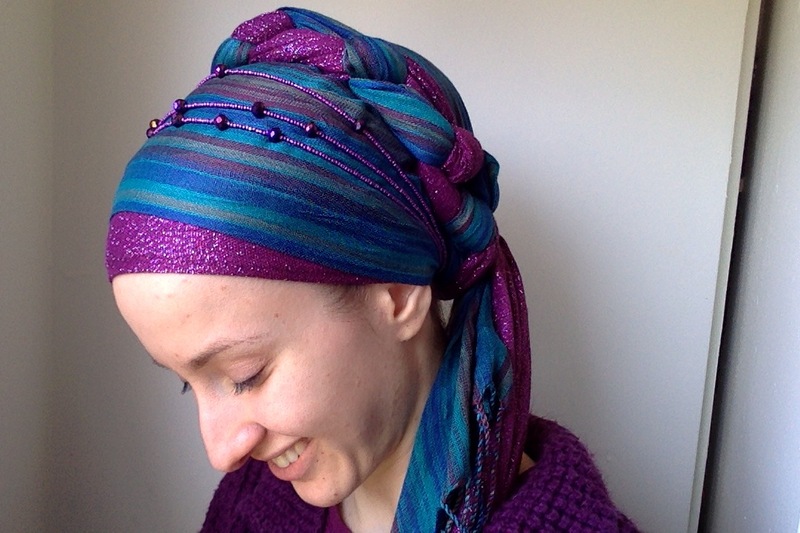 We also have a very rare, pre Pesach sale at the Wrapunzel Store happening only today (yes, right now! )… it is our first time doing something like this so we were uper duper excited! It has been so much fun watching so many creative orders come in and maintaining the site as the day goes on! I also had a very intense chamber music coaching this morning as well as a rehearsal later… and tonight is our dress rehearsal for a big concert next week! Whew! All in all, this has been a wonderful day so far! And I had to make sure when I got ready early in the morning that I wore something that could take me through the whole day! Here it is! 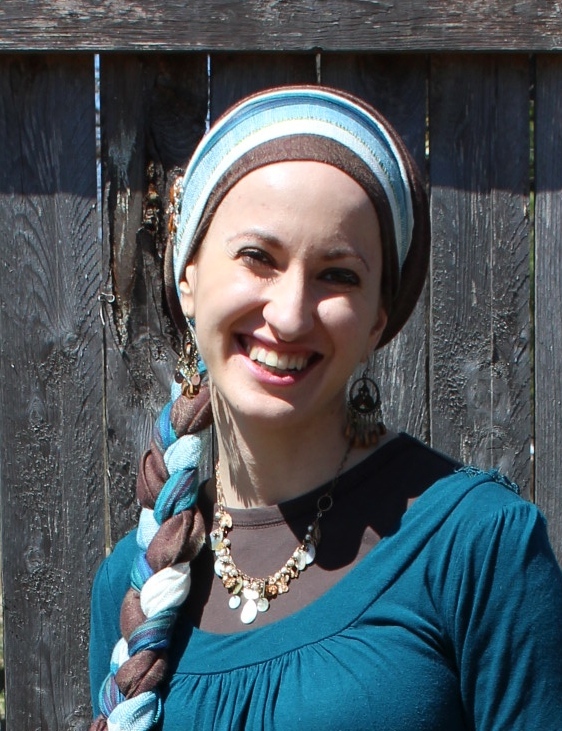 My tichel is a lovely warm combination of turquoise, white and brown… yum! 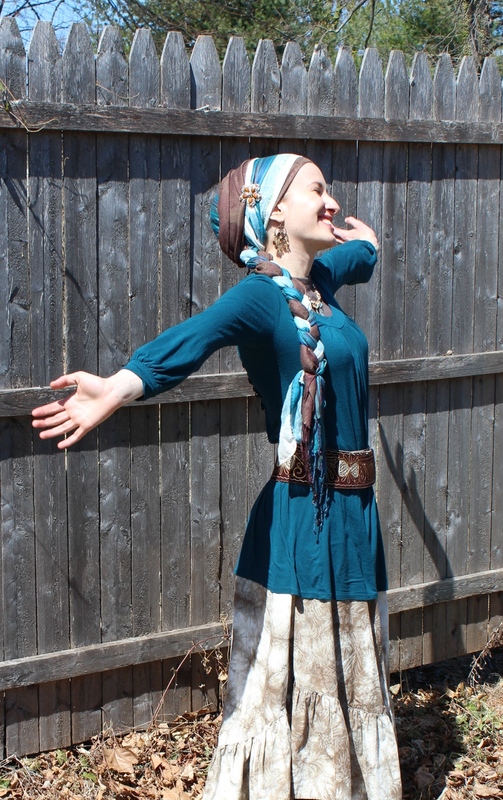 My outfit had to be nice enough to do a tichel show, comfortable enough to clean the house for pesach, practical enough to walk through some muddy bits to get to rehearsal, with a wide enough skirt to play the cello! I’m so happy with the results! And of course, the clothes are meaningless unless they reveal your inner essence, which I really feel like these clothes do today. I am so thankful today to know each and every one of you! Wishing you a gorgeous, productive, and meaningful week!